After one sip, my initial reaction was: anything with so much fat should taste way better than this. That said, I want you to know that I was, and am still, a huge fan of coconut milk. When I was a kid, my dad would, on occasion, bring home a whole coconut from the grocery store. I thoroughly enjoyed draining the juice out of the coconut and drinking it fresh out of a glass. Somehow I figured that coconut milk with the word "vanilla" before it would be sweeter and even more drinkable than the fresh coconut juice I remember from my childhood. But if you ask me, it wasn't. 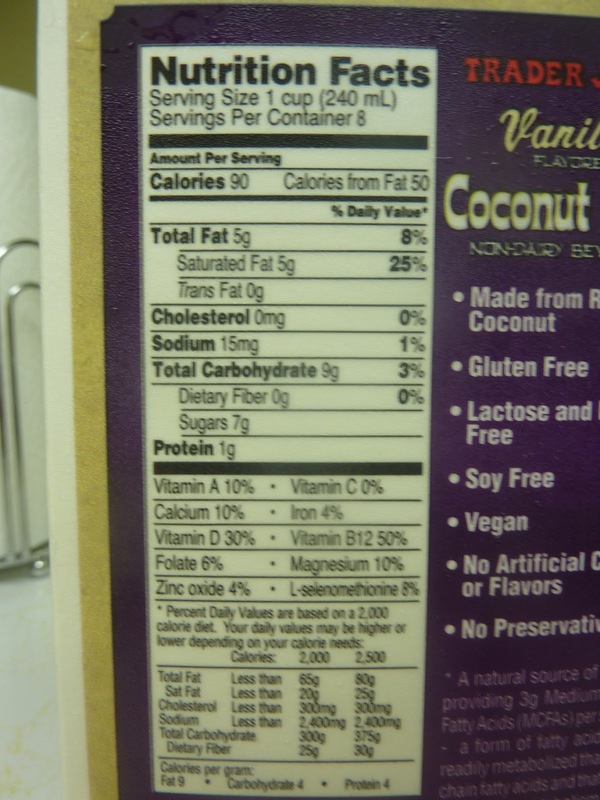 The vanilla flavoring did little to enhance the natural flavor of the coconut milk, and there just simply wasn't enough flavor to justify putting 5 grams of fat per serving into my body, as my body has just plenty of fat to contend with as it is. Although, I must admit that natural, nut-fruit-or-whatever-a-coconut-is-type-fat is always way better for me than most of the actual sources of fat in my current diet. Also, I might have been wanting it to taste like the Goya Cream of Coconut that we used in our piña coladas a while back. That stuff is tasty. But, it's massively fattening and I'm pretty sure there's more sugar in it than actual coconut. 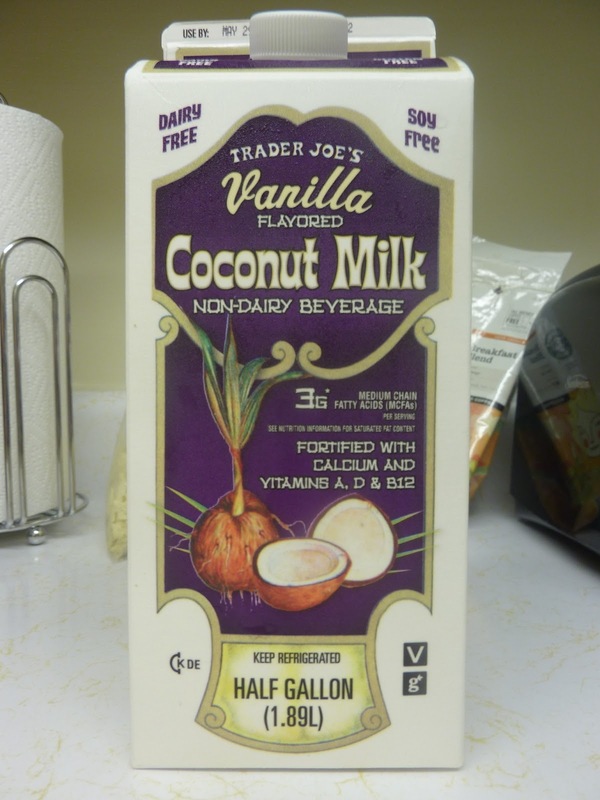 So, for health reasons, it's probably good that TJ's coconut milk tastes nothing like that Goya nonsense. On the plus side, this stuff is totally dairy-free (like regular coconut milk, which I would hope goes without saying). It is soy-free as well, and totally vegan friendly. Sonia loved it. She enjoyed its light taste. She put it on her cereal, and loved it that way, too. It was Cookie Crisp cereal—which pretty well offset any healthiness that might be in the coconut milk, but whatever. It comes in a convenient, attractive package, and it's fortified with calcium and vitamins. It sounds like they're setting it up against dairy milk and soy milk for those who are lactose intolerant and/or don't want lower sperm counts. It's probably a pretty viable alternative to other milks. To be fair, I should mention that I really don't like drinking plain dairy milk or soy milk at all either. On cereal is about the only way I have milk. And maybe a chocolate milk once in a while. I was just hoping that this stuff was gonna be fairly chuggable just by itself. But...not so much, in my opinion. It's not nasty, it's just kind of bland. If it had been called "coconut water," I might not have been so disappointed. But I can't be too hard on it, because it's not a dessert item, and it's not meant to be. It's unique. And for the lactose intolerant, it could really become an item that shows up on the grocery list frequently. I give it a 2.5. Sonia will be the reasonable one yet again and give it a good score despite the fact that it doesn't taste like candy. 4 from her. This is one you'll probably just have to try for yourself to see whether it's worth it or not. Tell us what you think below. Bottom line: 6.5 out of 10 stars. No way will I drink something with that much fat. I'll eat something with that much fat, but not eat it. I just want to clarify that coconut water is the stuff that comes out of the middle of the coconut. Coconut milk is made by grinding up the coconut meat and squeezing the liquid out of it. That is where the fat comes from. And there are all these new studies that show that coconut fat does amazing things for the body. You should google it...it might change your mind about being willing to consume something with that much fat poured on your breakfast cereal. 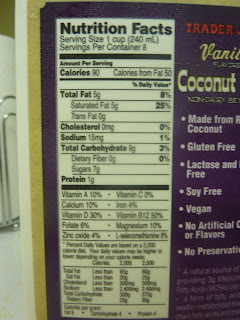 The fat from coconuts is extremely healthy. It has long chain fatty acids that actually help you burn fat. Also, I think people should understand that eating fat will not make you fat at all, as long as you consume the right kind. The problem comes when you eat stuff from highly processed foods. Agreed with the above comments. I use coconut oil in cooking, I put it in my hair, and I use it on my face to get rid of acne. It's severely all-purpose and good for you just like the fats in coconut milk. Yay fatty acids! Also I love rice milk vanilla flavored but it's the kind from Whole Foods I think...365 brand? Yes, the fat in coconut milk is VERY good for your metabolism as a whole. They are Medium chain Trigs, as opposed to the short chain trigs found in dairy products. They actually help get RID of the visceral fat associated with dairy products. I JUST started using this particular product to jump start my day instead of coffee. I drink this with my fish oil and CLA supplements approximately 30-45 mins after my protein shake. results have been phenomenal so far. I love the vanilla flavor, closest thing to real milk I've tasted. I havn't tried the plain one though, so maybe I will next time. But something tells me I'm going to stick to that hint of vanilla which is what sells it for me. Try it with equal part pineapple juice and some Kraken spiced rum... you got a party! I'm lactose intolerant so this dairy free soy free coconut milk beverage has been a blessing. I have it every morning instead of coffee..I mix it with honey and cinnamon...yummy and healthy! Yeah, l.e., I guess a bit of honey would help with the sweetness factor...and cinnamon—great idea! I bought the original - it was very disappointing. Absolutely no flavor - it was like drinking liquified Crisco. I am surprised how many people seem to like it? I use this for protein shake/smoothies. It is so much better than using plain water. Probably would never drink it by itself but it is excellent in smoothies - highly recommend.